30-day bans, wiped profiles thereafter. The GTA Online community reports multiple PC players received 30-day banning orders this weekend. The bans are said to be tied to the game's Southern San Andreas Super Sports Series update—with many players suggesting they've done nothing wrong. As detailed on the GTA Online subreddit, it appears tweaks to the PC version of the game's tunables have triggered a fault with its anti cheat detection system. 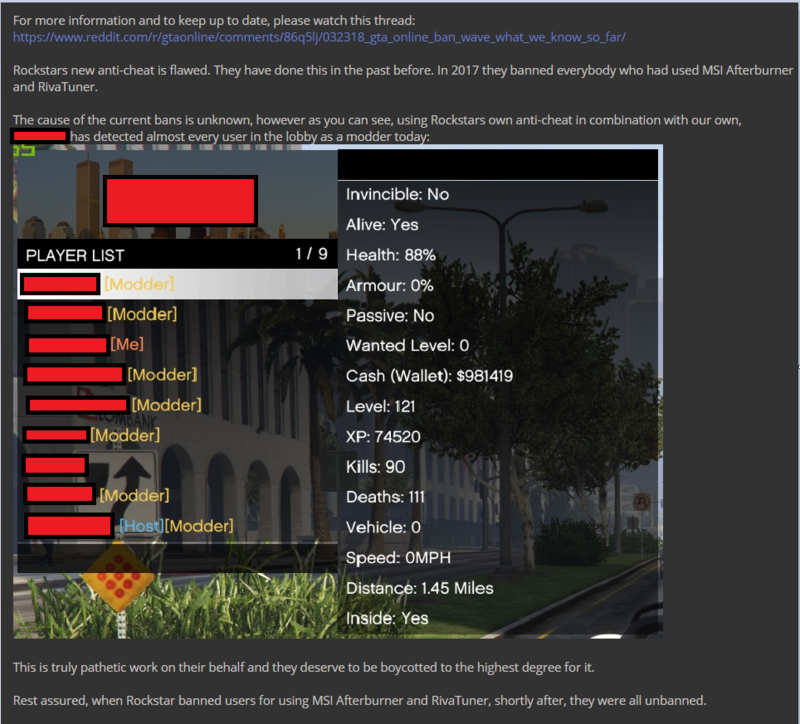 Discord user Funnypig reports their own anti-cheat software in turn identified a lobby full of modders—including the host and Funnypig themself. Identified by the subreddit, this Rockstar support thread includes comments from banned players—30 days, no appeal, wiped profiles—with anything between ten and 3,000 hours of logged game time. Naturally, it's not uncommon for banned players to claim innocence following bad behaviour, but the comments section below MikeRaven11's post is full of players who claim they've been unfairly removed. Rockstar is yet to comment on the situation, but the subreddit advises those affected to raise support tickets and/or contact the developer via its official Facebook and Twitter channels. Reddit person prove_your_point2 says: "If you use the word ban or choose the ban category, your support ticket will be auto-closed. Try to explain the situation without using that word." Moreover, prolific GTA 5/Online YouTube person MrBossFTW recommends playing in invite-only servers for now. In the meantime, GTA 5's Steam reviews have suffered a negative spike—similar to the backlash following last year's OpenIV debacle. We've reached out to Rockstar for comment and will update as and when we hear back. If you believe you've been unfairly banned yourself, tell us about your experience in the comments below.